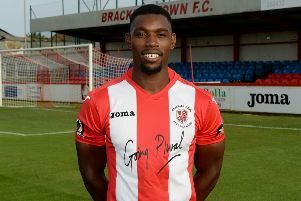 Two goals in each half brought Brackley Town a convincing first win in seven Vanarama National League North games to lift them out of the bottom three on goal difference. Saints beat fellow strugglers FC United of Manchester 4-0 in Saturday’s game at St James Park where loan signings Liam Slade, Matty Lowe and Junior English played a full part in galvanising Kevin Wilkin’s side after last Saturday’s disappointing 4-1 home defeat. Glenn Walker opened the scoring in the 11th minute, firing in from the edge of the area after United failed to clear a free-kick by Tom Winters. David Moyo hooked in the second from close range in the 39th minute following a Winters free-kick just before the interval. FC United rarely threatened but George Thomson brought a diving save from Sam Hornby and on the stroke of halftime Liam Brownhill kept the young keeper on his toes with a fierce shot. But Saints took complete control of the second half as Steve Diggin got the third goal five minutes after the restart set up by unselfish play from Moyo. Diggin almost had too much time to bring the ball under control and pick his spot with power and accuracy taking full advantage of woeful defending. Winters bagged the fourth goal himself in the 72nd minute, meeting Walker’s cross first time and giving keeper Dave Carnell no chance. In between, Saints had further chances to extend the lead and at the other end Hornby was more than a match for the occasional United foray, pulling off an excellent smothering save from Sam Madeley in particular.